Okay, here is the actual scenario in the ASHSAA's Boys Basketball League in the Varsity - Samoana is still undefeated so far, and this correspondent's apology for last week's article that reported that Samoana lost to Leone. No, the Samoana Sharks beat the Leone Lions. 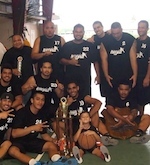 Samoana (8-0) is dominating the league as one of the best teams in the school's basketball history. The reason why this Samoana team is so dominant is because they have the best players in every position: centers Derek Uperesa and Simi Toeaina; forward Lotonu'u Seagai; shooting guard Ludwig Svortholm; and point guard Richie Amisone. This is the team with the best depth, because Martin Fruean can come in and play center, then Simi Toeaina can play in the "power forward." Forward Lotonu'u Seagai is the best shooter in the league and most of their offense is built around him. Richie Amisone is a very comfortable player in the point guard position with good skills, and Ludwig "white ears" Svartholm will always be hard to contain throughout an entire game. He is the fittest player in the league - he can run anybody out of stamina. Rambo Tapui comes off the bench and plays in the point guard position and he is a good shooter too. Samoana completes their dominance as the best "free throw' team in the league; they have an outstanding average of 80% from the line. They are still winning games in the double digits or at huge margins, except they did have the only game won with a single digit margin against the Tafuna Warriors at 41-39. Leone (6-2) is still trailing Samoana with two losses, but it is the only team that has the potential to upset Samoana in the second round, if they improve their free throws. They also have good centers in Selesele and Andrew, but they still need to dominate the low-post with accuracy scoring. They have one of the skillful of point-guards in the league, #13 Fale, who always initiates their magnificent passing drives, and they are a very unselfish team. The basketball season is heading into its final week of competition, and Samoana and Leone are already in the playoffs with three teams, Nu'uuli PolyTech Wildcats (4-4), Tafuna (3-5), and Faga'itua Vikings (3-5) vying for the last playoff spot. The Marist Crusaders (0-8) is the only winless team so far, and this team is facing the adversity of no other players beside Setu, Nicholas, and Richard, that can score points. They have a futile number of bench players. They lack height and a skillful point-guard to run their offense. In the Junior Varsity (JV) action, the Leone Lions is still remaining as the only undefeated team, and they are always being bound up with good players in this particular division. Faga'itua is trailing them with just two losses against five wins (5-2), and they are led by their #42 "Mr. Slam-Dunk" Ata. Samoana is in the third place so far with a (4-3) record. However, JV doesn't have a playoff round - their championship is decided on the team with the best record after the two rounds of competition. NPT took advantage of numerous turnovers by Samoana, and they took a huge lead after the first at 7-1, which was led by Dantley with 5 points. Samoana gradually crawled their way back, and made it a single point difference giving NPT 7-6 in the second, and a 7-14 lead in the half-time break.